Siena, a city without a waterway, has drawn its water for centuries from aqueducts and a complex system of underground canals called bottini. The 25 kilometers of water lanes that make up the bottini represent a remarkable medieval engineering achievement, having been carved right out of the rock that lies under the city's streets and palaces. Water channeled through these canals finds its outlet not only in homes but in the many beautiful fountains that grace all parts of the city. 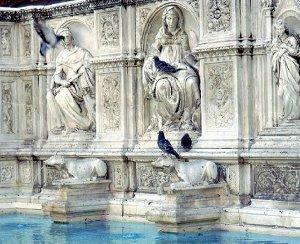 Of course the queen of all fountains is the Fonte Gaia in the Piazza del Campo. With its elegant classically-inspired reliefs by Jacopo della Quercia, this magestic fountain was created to celebrate the arrival of water from a mountainous ridge to the northern part of the city. Siena's next most famous fountain and one of its oldest is the terraced Fontebranda, found in the Oca district where Santa Caterina was born. Created in multiple levels that allowed the recycling of water from basin to basin, this fountain was so celebrated it is mentioned in the writings of Dante. Visitors should also look out for the seventeen quite varied contrada fountains. Important as gathering places, contrada symbols and water sources for the secular baptism of baby contradaioli, these fountains are often quite contemporary looking and imaginative in design. In some cases, such as the fountain of the Civetta or Owl contrada, they are so unusual and un-fountainlike, they remain “hidden in plain sight”...!